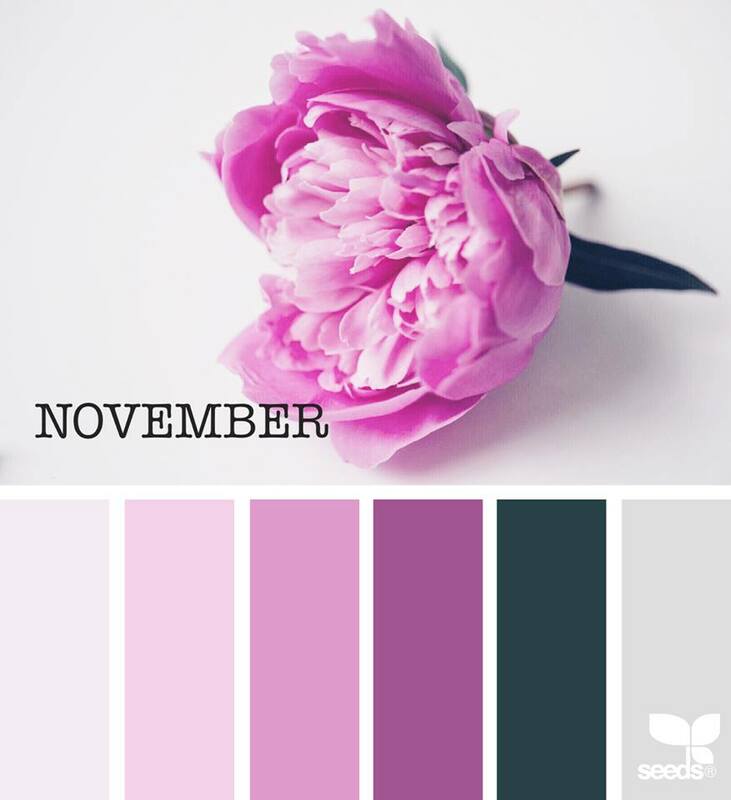 Hello, Carol with you today to kick start this months colour theme. 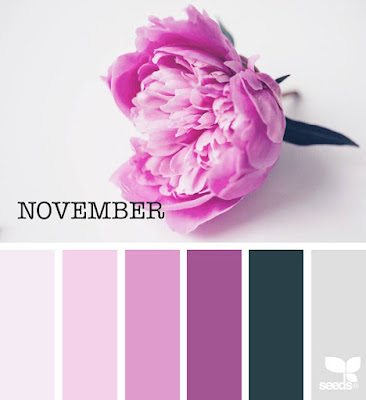 Please call back during the week to see some more colour makes. 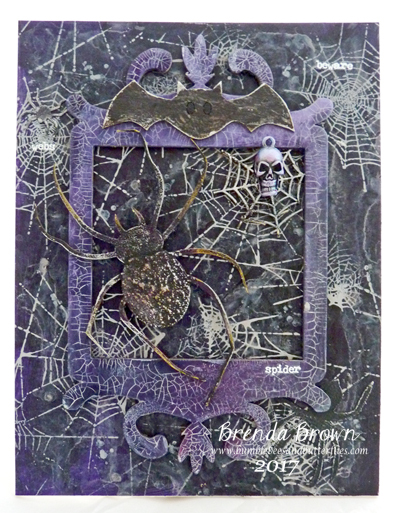 Welcome to Halloween Saturday, it's Brenda with you today and I have a media board to show you, not the usual size you find in the shop but one cut for me by Di as I love easel boards and I have made my own stand for it too. If you are attending the Ministry of Mixology Retreat in Coventry in a couple of weeks time you will see me using them for my Demo and Make and Take sessions. This is quite a dark piece of art but spiders live in the cracks and crevices of our buildings and under the floorboards so I wanted it to be a bit more eerie and slightly foreboding. and both a huge and a couple of small spiders situated around the frame. Here you can see the back and how it stands. Thanks for popping by and if you'd like to see the process steps in further detail and with more photos please join me at Bumblebees and Butterflies. Media Board - If you are going to Mixology in a couple of weeks time I will be using one for my Make and Take. 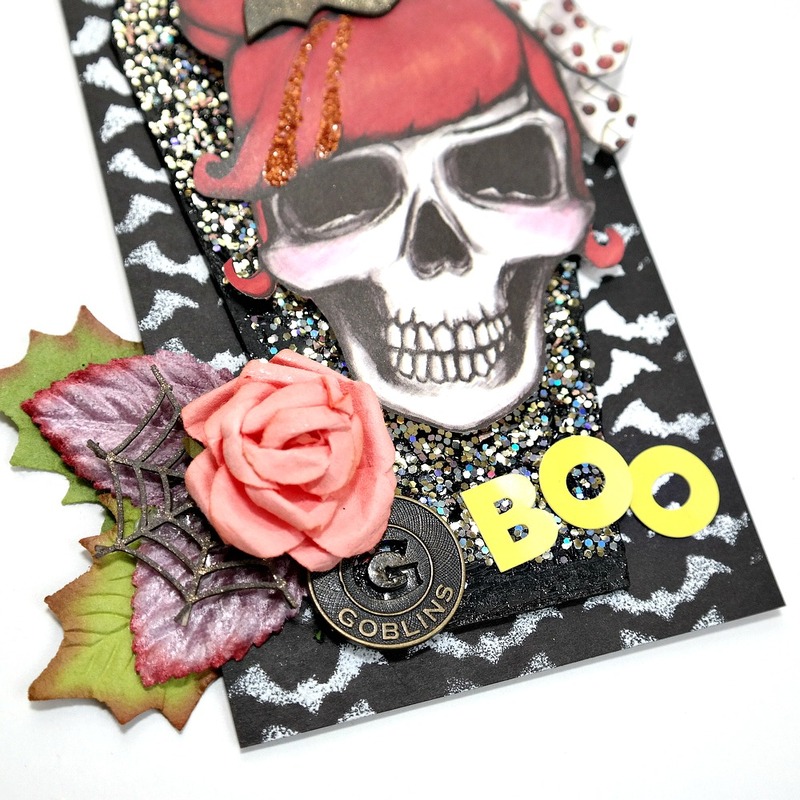 Hi all, it's Halloween week here at Tando Towers! I have created a spooky shrine complete with skeleton using Andy Skinners' Arch Kit from this years Dare to Create. I have used a range of colours from DecoArt including chalky finish paints to the background, and media fluid acrylics to the surface. The whole piece includes a layer of crackle medium, that has been rubbed away in areas to give an even more weathered look, revealing the multiple layers underneath. 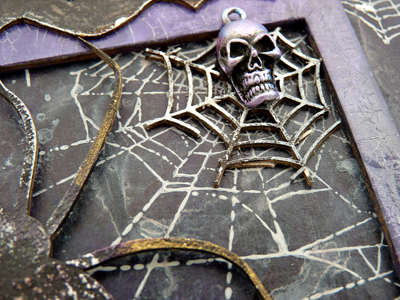 The main motief for the centre of the shrine is a skeleton stamp from Andy Skinner, printed on clear polyester film. Bright colours have been splattered to the reverse of the film. The backing to the piece has been painted in the same combination as the front but with deeper washes of Paynes and Medium Grey to provide a darker background. The use of film not only gives a high shine finish, it also created a sense of depth. Here you can see the layers of paint to the frame of the shrine. 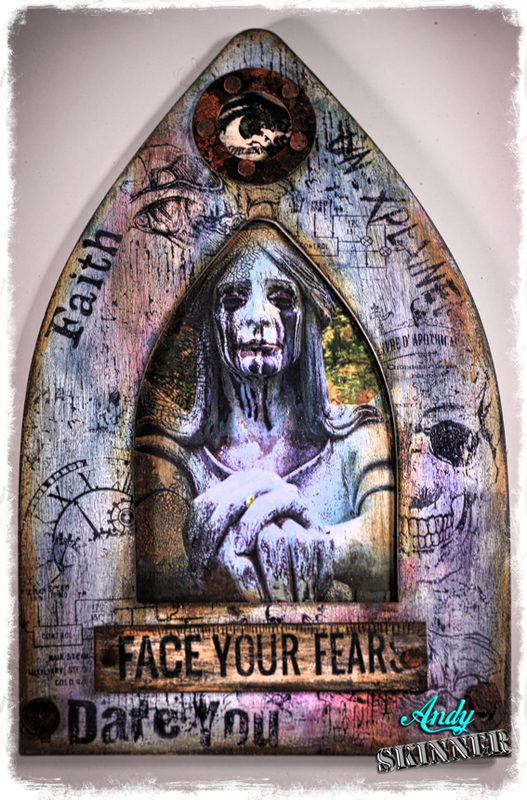 The plaque is stamped witht the phrase "Face Your Fears" and the piece is edged in Metallic Gold for contrast. 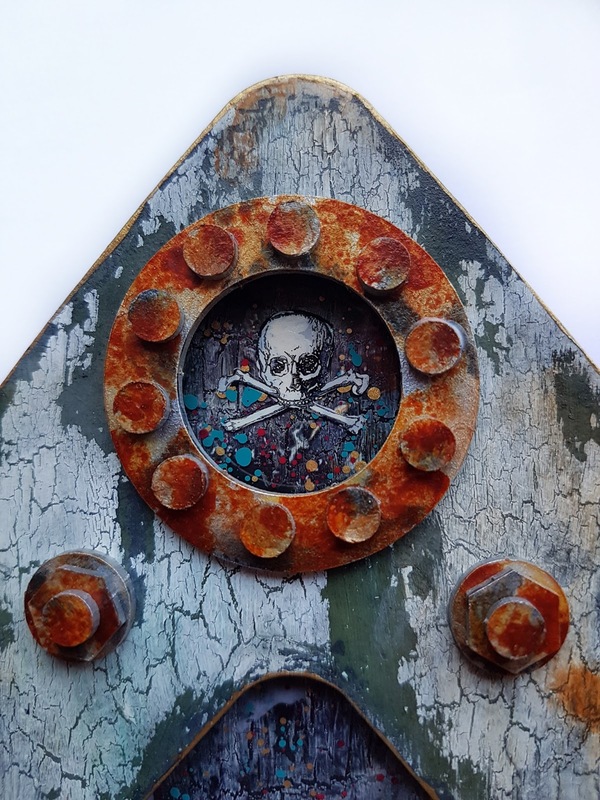 For the top apature I repeated the same process as for the main window with a skull and cross bones stamp. 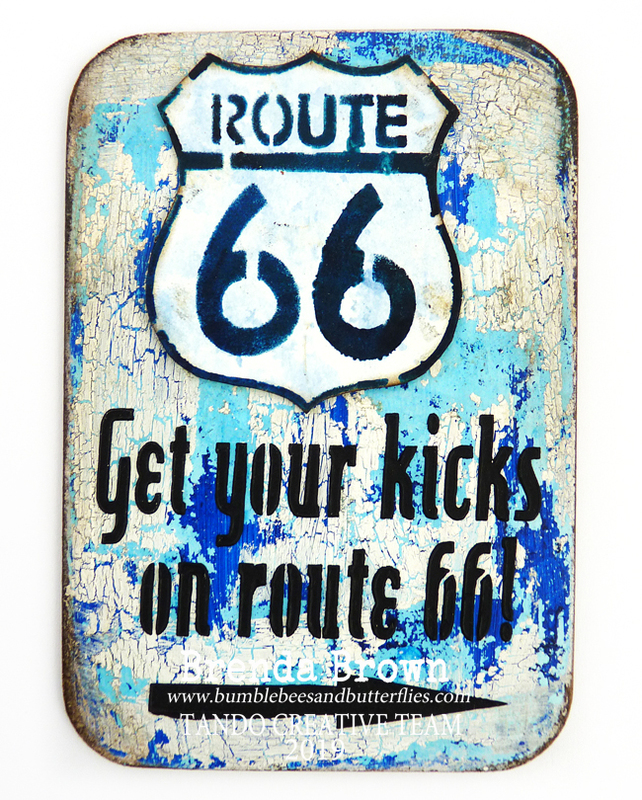 This has been surrounded by the embellishments provided within the kit, painted to a rusted finish. than a purple or orange. 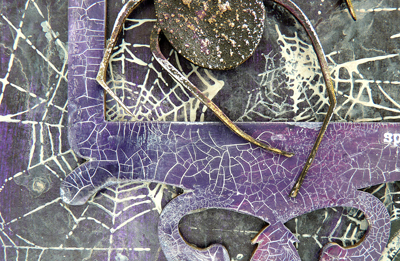 modeling paste followed by white crackle paste and clear crackle paste. A bit of texture was added with art powder and micro beads as will. must admit I am very happy with the result's. a pallet knife and allowed to dry. set I used was urban chic mixed with deco art glazing medium. A couple of washes of Prusssian Blue hue to unify it. 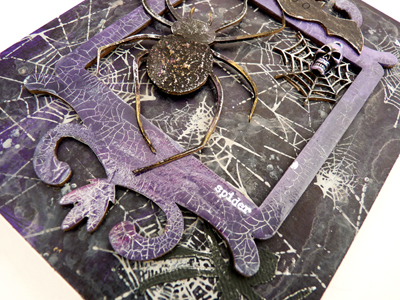 Tando products used :-Words Halloween & Layered Arch with Cobweb. Deco Art products used:- Media: White Crackle PASTE, Media: White Modelling Paste, Fluid Acrylics: Prussian Blue Hue & Ferro. From my stash:- Tim Holtz stamp, Lyndys stamp gang magicalls, distress ink in vintage photo and scattered straw & Cogs and washers. Hi! 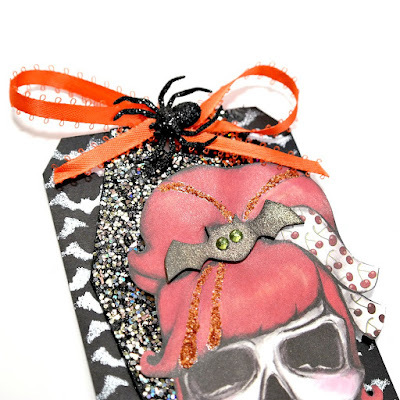 Dana here today sharing the tag I created for the Halloween theme this week. 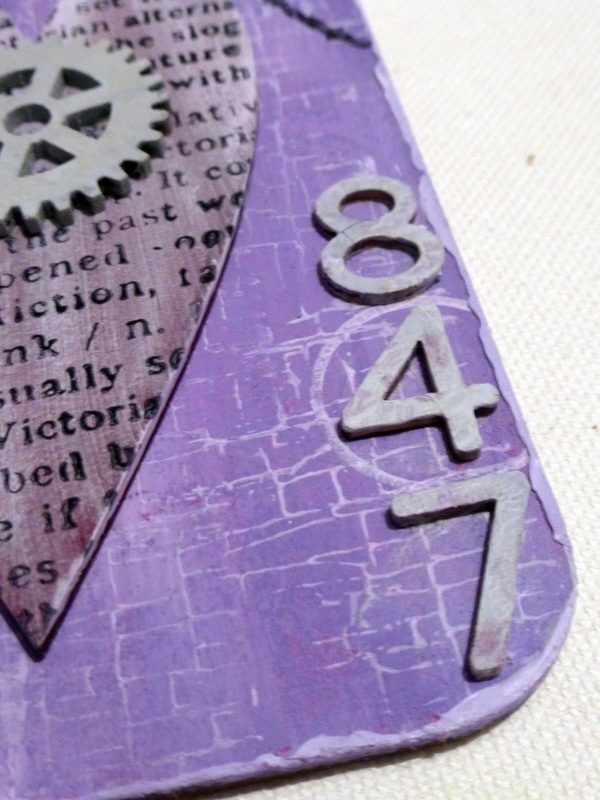 I started this project by a stenciling and embossing a bat pattern onto a black tag. I used a coffin from the Pair of Skeletons set as a fun second layer. 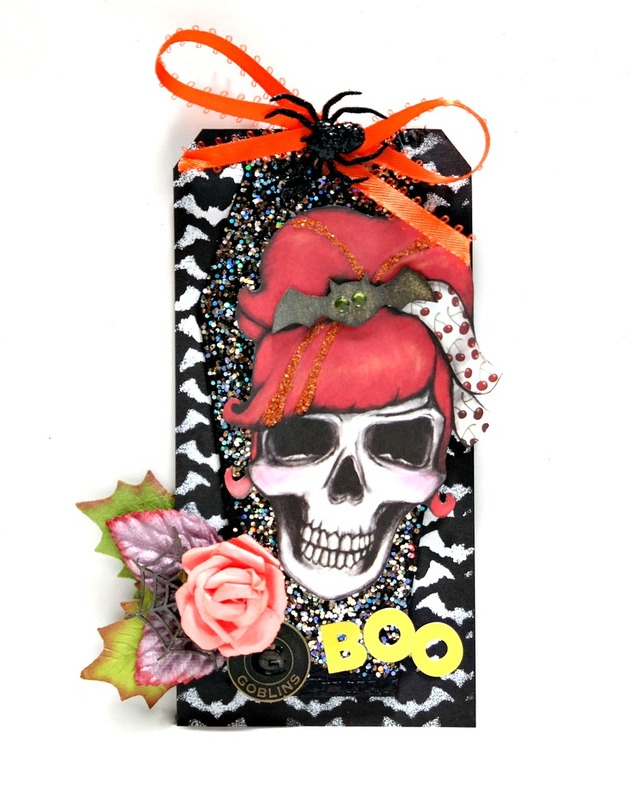 I covered the chipboard coffin with black crackle paint and then a layer of Stampendous Spoonful of Midnight. I'm really dating myself using a fun piece of Halloween patterned paper from Creative Imaginations! I absolutely love the dressed up skull. I embellished the highlights in her hair with glitter glue and then added a small bat, from the Tando Minis Mixed Halloween Set, that I sprayed with Tattered Angels Black Magic Glimmer Mist, which is a wonderful combination of black ink and gold shimmer. I added two green rhinestones for the eyes. I created a colorful flower cluster for the bottom of the tag. I tucked half of a mini spider web, also from the Mixed Halloween Set, under the flower petals. 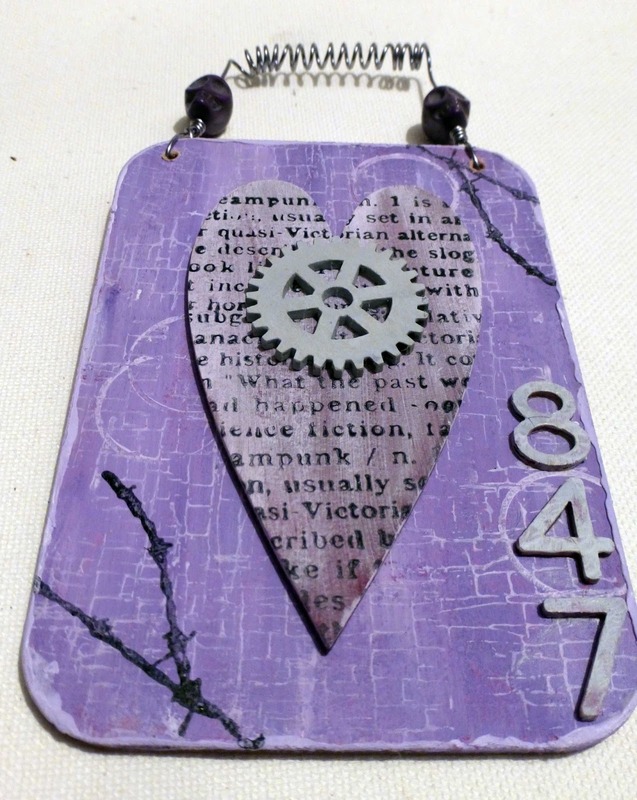 Hello my dear crafty friends and welcome to my new Tando inspirational post. 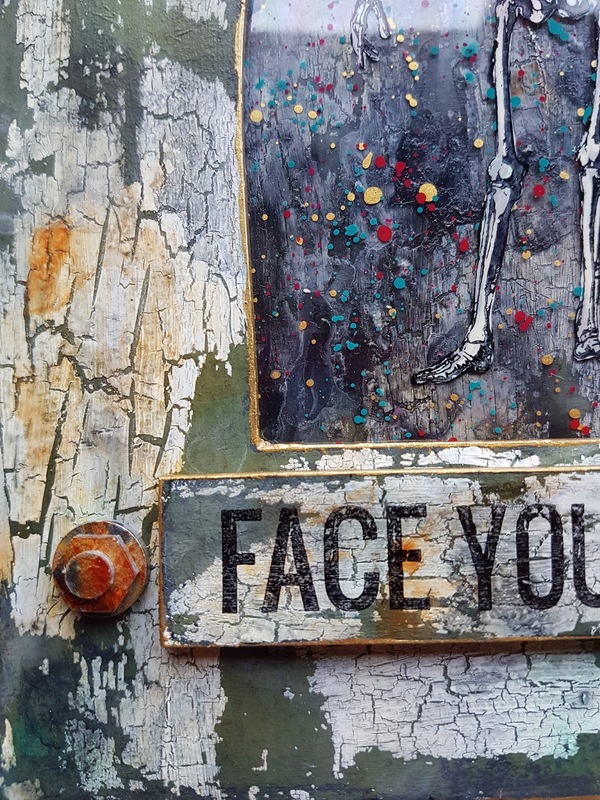 We are close to the Halloween and this is our scary week here on Tando blog. 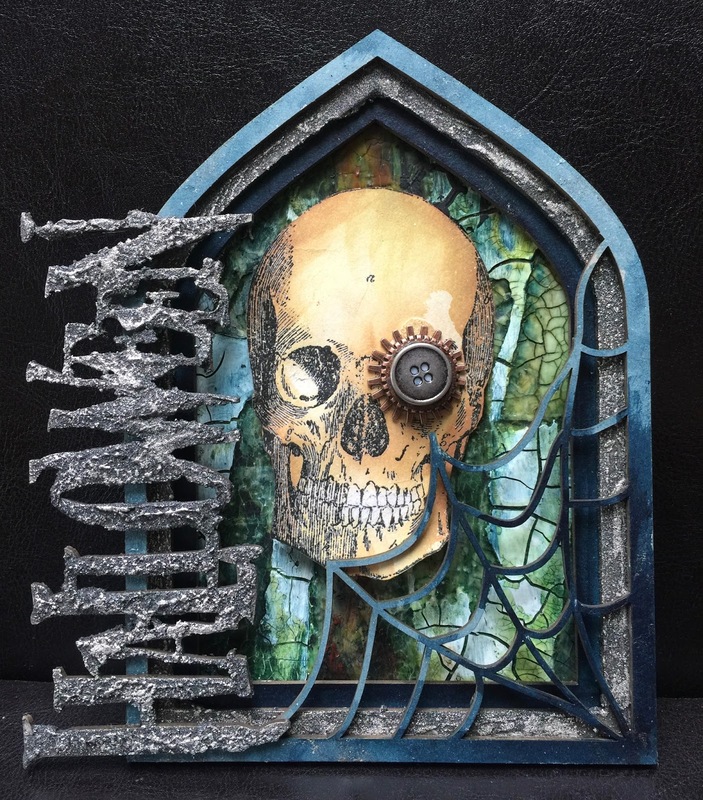 As you can see I used Tando Halloween arch set and the skeleton together with the Voodoo mask and a lot of DecoArt Media line products. First I painted all layers of the arch. 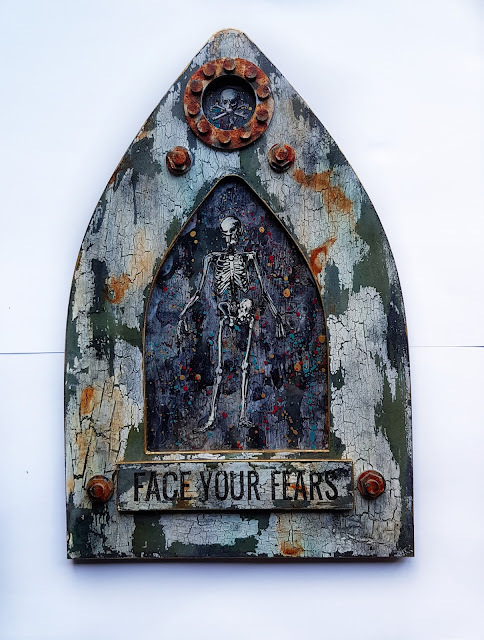 Then I added the masked image inside the arch using copper paint mixed with glitter and even added some copper embossing powder into it. 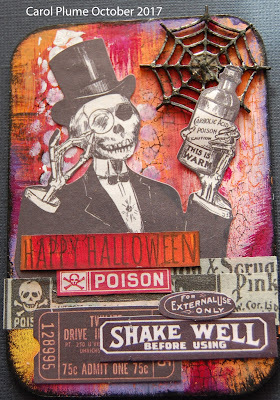 The image was heat embossed and then the white painted skeleton was added over it. First I covered the skeleton with clear glaze and when it was dry I added splashes of different acrylics over the whole piece. 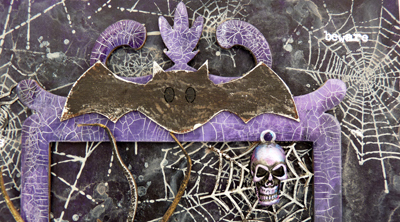 It's a very easy to make Halloween decoration and you don't need to be the Mixed Media specialist to make the similar project in no time. I've made two makes for today…first up.. 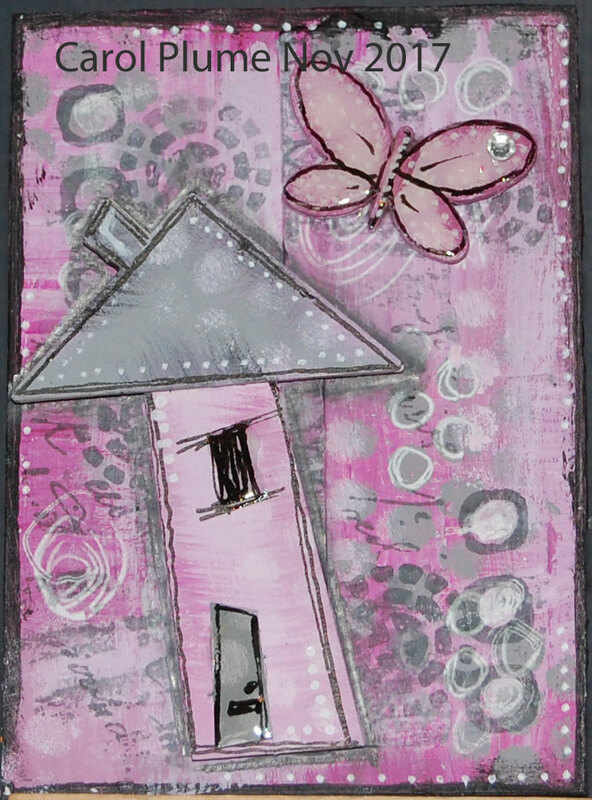 The base is a mixed media board which was painted using acrylic paints and then over stamped and stencilled using paint and the sequin waste stencil. 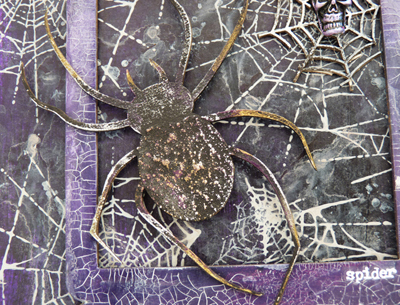 A spiders web from the minis mixed hallowe'en pack was painted then given a coat of glossy accents. Ephemera was then added to finish it all off. 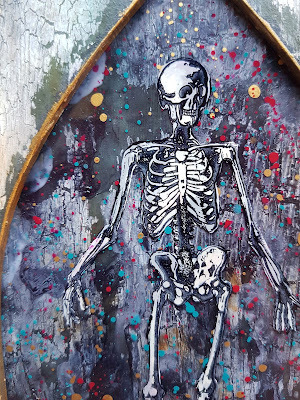 The base for my second piece comes from the pair of skeletons pack, just the base was used on this project. A large skull from the skulls bag 3 with added skull and bat from the hallowe'en minis pack was then added along with more ephemera finish it all off. Hi folks, Lisa here and welcome to my blog post for today. It's an 'anything goes' week at Tando this week. 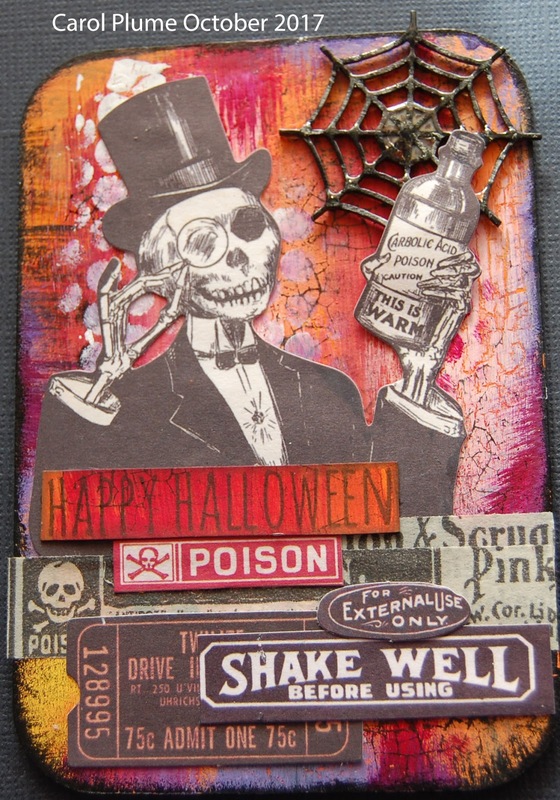 So, I chose to play with the Tando Ministry of Mixology Kate Crane Journal. Everyone loves a journal, but creating your own cover makes it even more personal and I had so much fun with this project. Firstly, I chose lots of different fabrics and ribbons with lots of texture such as lace and hessian. 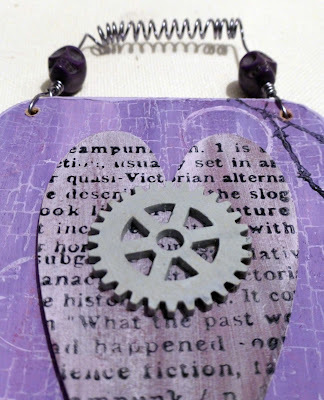 I adhered these bits to the front cover of the journal, layering and overlaying different pieces to create lots of texture. And because there was so many layers to stick, I adhered them with matte heavy gel medium rather than a standard glue. I then raided my trinket box - which is masssiivvvveee!! It is full of metal embellishments, fabric and paper flowers, buttons, broken jewellery bits, cameos... along with bits and pieces of allsorts and everything. So, I had a good rummage and pulled out a few items. I then arranged, re-arranged and re-arranged the trinket finds on to the journal cover. Again, using the matte heavy gel medium I adhere the embellishments on to the cover. When all the embellishments were fixed in to place, I covered the entire journal front with DecoArt black Gesso and left to dry. Then came the fun bit... I pulled out a selection of colours of DecoArt Media Acrylic paints. I used Blue Green Light,Cobalt Teal Hue, Colbalt Turquoise Hue, Primary Cyan, Yellow Green Light along with white and black DecoArt Gesso. After splashing a bit of paint about until I was happy, I let everything dry. 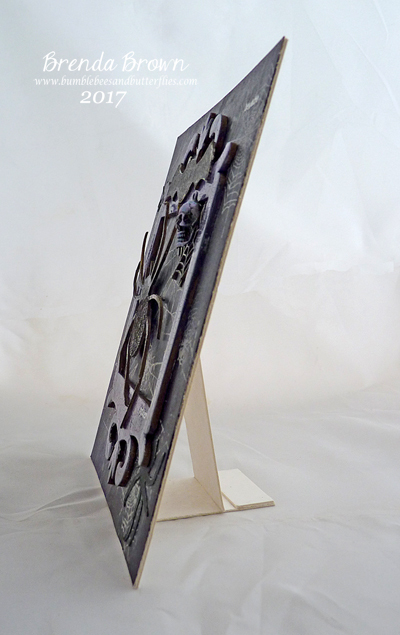 Then I applied a couple of coats of DecoArt Media Ultra Matte Varnish to make sure everything looked ultra matte and to add a bit of protection to the cover. I hope you have enjoyed looking at my latest creation. If you would like to leave a comment please do so, I love to hear what you think. Here is everything I used, which is all available from the Tando website.